Pacific, Mo. 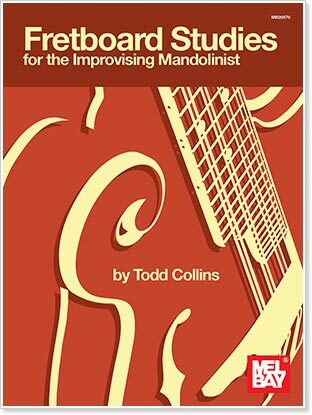 — Mel Bay Publications, Inc. has announced the release of Fretboard Studies for the Improvising Mandolinist by Todd Collins, a collection of tools to help improve one's knowledge of the fretboard. Scales, arpeggios, patterns, intervallic exercises and progressions are included. Exercises help the player build muscle memory and musical ideas anywhere on the fretboard. A collection of tunes is also included. Connect the physical with the theoretical and become a better improviser. Mel Bay Publications, Inc. has announced the release of Fretboard Studies for the Improvising Mandolinist by Todd Collins, a collection of tools to help improve one's knowledge of the fretboard. Nice! I'll be on the lookout for this one. Mel Bay does it again! A whopping 3 sample pages, so you know exactly what you are buying--and one of those pages is a circle of 5ths chart! It looks like it could be an interesting book, but I wouldn't risk my money with so little information. I purchased this book and though I do have a couple of complaints I would recommend it highly to Intermediate/Advanced players that are searching for the secrets of improvisation. The is largely a very thorough set of exercises that are really interesting and fun. I have been playing mandolin for 10 years now and in the last 5 have been practicing a couple hours a day almost everyday. This book showed me some really cool ways to practice and see the Fretboard in some ways I haven't been able to see as of yet. The exercises range from closed position scales, arpeggios double stops, single string shifting... a whole bunch really cool ones. If your interested in understanding the fretboard completely (if you want to improvise you had better) this book is worth it. I would not recommend it for beginners and I have found a few typos that kind of pissed me off. Other than that I love it. Quote from Steve Gorman: I purchased this book and though I do have a couple of complaints I would recommend it highly to Intermediate/Advanced players that are searching for the secrets of improvisation. The is largely a very thorough set of exercises that are really interesting and fun. I have been playing mandolin for 10 years now and in the last 5 have been practicing a couple hours a day almost everyday. This book showed me some really cool ways to practice and see the Fretboard in some ways I haven't been able to see as of yet. The exercises range from closed position scales, arpeggios double stops, single string shifting... a whole bunch really cool ones. If your interested in understanding the fretboard completely (if you want to improvise you had better) this book is worth it.